A new method for assessing patterns of ground-force application suggests the right and left legs of the world's fastest man may perform differently, defying current scientific assumptions about running speed. World champion sprinter Usain Bolt may have an asymmetrical running gait, according to data recently presented by researchers from Southern Methodist University, Dallas. While not noticeable to the naked eye, Bolt's potential asymmetry emerged after SMU researchers assessed the running mechanics of the world's fastest man. The analysis thus far suggests that Bolt's mechanics may vary between his left leg to his right, said Andrew Udofa, a biomechanics researcher in the SMU Locomotor Performance Laboratory. The existence of an unexpected and potentially significant asymmetry in the fastest human runner ever would help scientists better understand the basis of maximal running speeds. Running experts generally assume asymmetry impairs performance and slows runners down. "Our observations raise the immediate scientific question of whether a lack of symmetry represents a personal mechanical optimization that makes Bolt the fastest sprinter ever or exists for reasons yet to be identified," said Udofa, a member of the research team. The SMU Locomotor Lab, led by Peter Weyand, focuses on the mechanical basis of human performance. The group includes physicist and engineer Laurence Ryan, an expert in force and motion analysis, and doctoral researcher Udofa. The intriguing possibility of Bolt's asymmetry emerged after the SMU researchers decided to assess his pattern of ground-force application—literally how hard and fast each foot hits the ground. To do so they measured the "impulse" for each foot. Impulse is a combination of the amount of force applied to the ground multiplied by the time of foot-ground contact. 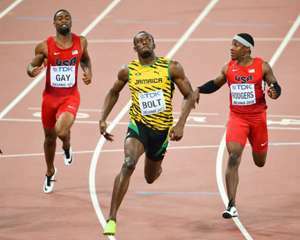 "The manner in which Bolt achieves his impulses seems to vary from leg to leg," Udofa said. "Both the timing and magnitude of force application differed between legs in the steps we have analyzed so far." Impulse matters because that's what determines a runner's time in the air between steps. "If a runner has a smaller impulse, they don't get as much aerial time," Weyand said. "Our previous published research has shown greater ground forces delivered in shorter periods of foot-ground contact are necessary to achieve faster speeds. This is true in part because aerial times do not differ between fast and slow runners at their top speeds. Consequently, the combination of greater ground forces and shorter contact times is characteristic of the world's fastest sprinters." The researchers didn't test Bolt in the SMU lab. Instead, they used a new motion-based method to assess the patterns of ground-force application. They analyzed Bolt and other elite runners using existing high-speed race footage available from NBC Universal Sports and viewable below. The runners were competing in the 2011 Diamond League race at the World Athletics Championships in Monaco. Udofa analyzed 20 of Bolt's steps from the Monaco race, averaging data from 10 left and 10 right. The researchers relied upon foot-ground contact time, aerial time, running velocity and body mass to determine the ground reaction forces using the new method, called the "two-mass" model of running mechanics. Runners typically run on a force-instrumented treadmill or force plates for research examining running ground-reaction forces. However, the two-mass model method provides a tool that enables motion-based assessments of ground reaction forces without direct force measurements. "There are new avenues of research the model may make possible because direct-force measurements are not required," Weyand said. "These include investigations of the importance of symmetry for sprinting performance. The two-mass model may facilitate the acquisition of data from outside the lab to help us better address these kinds of questions." Udofa presented the findings at the 35th International Conference on Biomechanics in Sport in Cologne, Germany. His presentation, "Ground Reaction Forces During Competitive Track Events: A Motion Based Assessment Method," was delivered June 18. SMU researchers developed the concise two-mass model as a simplified way to predict the entire pattern of force on the ground—from impact to toe-off - with very basic motion data. The model integrates classic physics and human anatomy to link the motion of individual runners to their patterns of force on the ground. It provides accurate predictions of the ground force vs. time patterns throughout each instant of the contact period, regardless of limb mechanics, foot-strike type or running speed. The two-mass model is substantially less complex than other scientific models that explain patterns of ground force application during running. Most existing models are more elaborate in relying on 14 or more variables, many of which are less clearly linked to the human body. "The two-mass model provides us with a new tool for assessing the crucial early portion of foot-ground contact that is so important for sprinting performance," said Udofa. "The model advances our ability to assess the impact-phase force and time relationships from motion data only." The two-mass model was developed in SMU's Locomotor Performance Laboratory by Kenneth P. Clark, now an assistant professor in the Department of Kinesiology at West Chester University, West Chester, Pa.; Ryan, a physicist and research engineer at SMU's Locomotor Performance Laboratory; and Weyand. The researchers described the two-mass model earlier this year in the Journal of Experimental Biology in their article, "A general relationship links gait mechanics and running ground reaction forces."